I knew there were was going to be a good bit of car time while the boy and I were traveling to/from/around New York. I finished up a Christmas gift on our way to New York (well in the hotel that evening) and then I swatched for Liesl the long. I cast it on and then didn’t pull it out of the bag during a couple of our shorter car trips. I pulled it back out on our drives to and home from Canada. Then last night I worked on it at knit night and once I got home until I finished the body. All that I have left right now is the sleeves. It would be awesome if I could finish it tonight. It turns out that the sleeves are more finicky than I would have thought. I only have circular 7mm needles so I am having to magic loop the sleeves. Here’s a picture of my current progress. 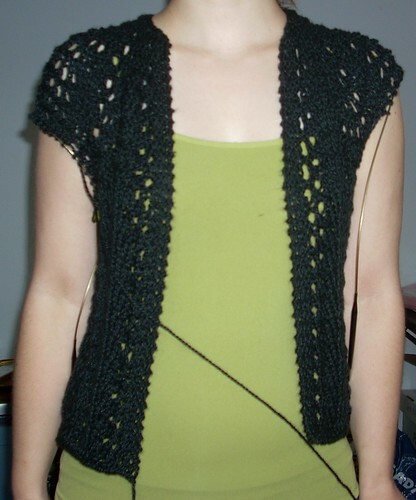 This entry was posted in Knitting, WIP and tagged Knitting, WIP. Bookmark the permalink. That looks GREAT so far!!!! Looking good! I’ve sewn sleeves in upside down before now, so I know the feeling. Oops!